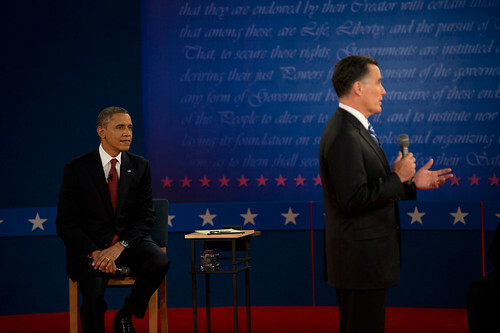 During the second presidential debate, candidate Mitt Romney accused President Obama of causing a decline in extraction of energy resources from public lands. Although this accusation is misleading if not outright false, Obama could have derailed Romney entirely by agreeing with him and taking credit. ROMNEY (what he actually said): "As a matter of fact, oil production is down 14 percent this year on federal land, and gas production is down 9 percent. Why? Because the president cut in half the number of licenses and permits for drilling on federal lands and in federal waters." OBAMA (what he could have said): "As President and steward of our federal lands, I am proud of the fact that the resources on these lands are managed and conserved. Our federal lands are meant not just for our generation, but for the next and the next and the next ten after that. Governor Romney appears hell-bent on extracting every drop of oil, molecule of gas and lump of coal from our federal lands as soon as humanly possible. Right now the private sector is preferring to find resources on private lands rather than public. That is good. Since that's the case, I believe we should conserve the resources we have on our public lands for the future, when our descendants may need them more than we do. So thank you, Governor Romney, for complimenting me on my conservative approach to use of our public lands. I am proud that we are deliberately and carefully managing those resources for use of all Americans, present and future."